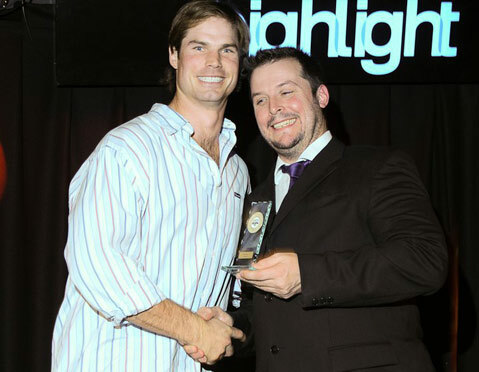 Bradlee is given the 2010 MVP trophy for the Leicester Falcons of the British American Football Association. He is pictured with Falcons general manager Guy Kersey. Van Pelt was a quarterback who ran like a bull at San Marcos High and Colorado State. The Broncos drafted him in 2004, but he never got much of an opportunity to prove himself in two NFL seasons, playing behind Jake Plummer and Jay Cutler. He frankly conceded that his passes, like Tebow’s, were not always on target. Both men are big for the position — the 6′2″ Van Pelt played at 220 pounds, and Tebow is listed at 6′3″, 245 pounds. “I remember seeing this picture [of Tebow] in GQ Magazine, and I was thinking, ‘That guy looked like me,’” Van Pelt said. But looking like a bodybuilder can be a detriment, Van Pelt said. After his stint in Denver, Van Pelt was a third-stringer with the Houston Texans, had a failed tryout with the Broncos at safety — a position at which his father, the late Brad Van Pelt, was an All-Pro with the New York Giants — and then he was a starting quarterback for two European teams, the Bergamo Lions of Italy and the Leicester Falcons of the British American Football Association. Van Pelt ended his playing career in 2010 as the MVP of the Falcons.